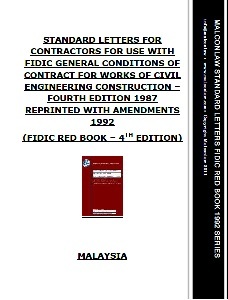 This entry was posted in Industry News, Malaysia Law, Posts and tagged Contractors Tool Kit, Facebook, FIDIC, FIDIC Red Book, Letter of intent, Malaysia, Sample Letters - FIDIC, Standard Letters. Bookmark the permalink. At present the letters are not available for general download. They will be added shortly to the Contractors resources section together with Red Book 1999, PAM and Yellow Book 1999. Those that responded to the event on Facebook received advanced copies. Please bear with us and you will be informed when they are available.